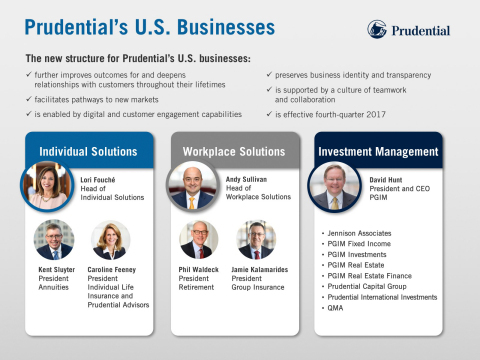 Prudential Financial, Inc. (NYSE:PRU) today announced a new organizational structure for its U.
Prudential Financial, Inc. (NYSE:PRU) today announced a new organizational structure for its U.S. businesses that extends its customer reach and facilitates pathways to new markets. The structure better reflects the company's strategic focus on leveraging its mix of businesses and its digital and customer engagement capabilities to expand its value proposition for the benefit of customers and stakeholders. "Our strategy, enabled by our culture of teamwork and collaboration, sets us on a path to serve a broadening range of customers as the leading provider of integrated financial wellness solutions. It does so in a way that benefits from and contributes to our success as a global investment manager," said John Strangfeld, chairman and CEO of Prudential. "Prudential has always operated with a 'customer first' philosophy," said Stephen Pelletier, executive vice president and chief operating officer of Prudential's U.S. businesses. "To further improve outcomes for our customers, we have formalized an organizational structure that allows for greater agility and integration in how we engage, serve and deepen relationships with our customers throughout their lifetimes." Under the new structure, which will become effective in the fourth quarter of 2017, the company's five U.S. businesses will be aligned under three groups oriented to the needs of specific customers. Each group will have a leader focused on understanding customer needs, experiences and expectations, and applying that understanding to capture growth opportunities within and across businesses. Individual Solutions will comprise Annuities and Individual Life Insurance, and be led by Lori Fouché, who currently leads Annuities. Kent Sluyter, who currently oversees Individual Life Insurance, will become president of Annuities. Caroline Feeney, who currently leads Prudential Advisors, will become president of Individual Life Insurance, which includes Prudential Advisors. Salene Hitchcock-Gear, currently chief operating officer of Prudential Advisors, will become president of Prudential Advisors and report to Feeney. Workplace Solutions will comprise Retirement and Group Insurance, and be led by Andy Sullivan, who currently leads Group Insurance. Phil Waldeck will continue to lead Retirement, and Jamie Kalamarides, currently head of Full Service Solutions within Retirement, will become president of Group Insurance. Investment Management will continue to comprise all PGIM businesses, including PGIM Investments, and will continue to be led by David Hunt, president and CEO of PGIM. According to Pelletier, the structure maintains foundational strengths, builds on new and existing capabilities, and anticipates the emerging needs of customers within a changing market and an evolving workplace. "It provides clear leadership and accountability, and facilitates resource allocation to capitalize on growth opportunities, while continuing to provide transparency at the business segment level," he said. Prudential Financial, Inc. (NYSE: PRU), a financial services leader with more than $1 trillion of assets under management as of June 30, 2017, has operations in the United States, Asia, Europe and Latin America. Prudential's diverse and talented employees are committed to helping individual and institutional customers grow and protect their wealth through a variety of products and services, including life insurance, annuities, retirement-related services, mutual funds and investment management. In the U.S., Prudential's iconic Rock symbol has stood for strength, stability, expertise and innovation for more than a century. For more information, please visit news.prudential.com.